This is one of my regular standbys: easy and delicious. Tofu cooked in this way is intensely flavoured. It's essential to use a firm, slightly crumbly tofu, such as that produced by Cauldron, not the slippery 'silken' variety. You can use ready-made pesto to save time, or whip up your own. Mix all the marinade ingredients together in a bowl. Put the tofu in a dish large enough for it to form one layer and cover with the marinade. Set aside for at least 30 minutes. Toss the sweet potato slices in the olive oil, Tabasco and a little salt and pepper and lay in one layer on a baking tray. Bake for 30 minutes, turning once, or until tender and well browned all over. Blanch the green beans in salted boiling water for about 8 minutes till tender and refresh quickly under cold water. Set aside. If you're making your own pesto, do this now: process the garlic and pine nuts together in a food processor, then add the basil and Parmesan and blitz again, while you slowly pour in the olive oil. Season with salt. Transfer the tofu and its marinade to a large saucepan. Simmer on a medium heat until the marinade is completely reduced and the tofu is left frying in a sticky, dark sauce. Keep going for 7-8 minutes so that the tofu is very well browned. You can gently ease it off the bottom of the pan with a metal fish slice and turn it over so that it browns and crisps on all sides. Don't worry if it breaks up a bit. 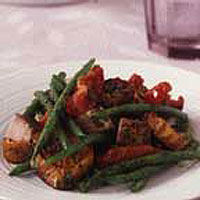 Place the roasted sweet potatoes, green beans, roasted tofu and dried tomatoes in a bowl and gently mix with the pesto. Serve at once with a salad of rocket, chicory, red onion and Parmesan, dressed in olive oil and balsamic vinegar.